Wow! A game that makes a child feel like a winnter all of the time? That is tops in my book! Wish I had a little one around to try it out. My favorite part of winter is all the games the kids bring out to play!! sunday funday always ended with game night.....this sounds fun!! What a fun game! I loved getting to see your guys playing it. 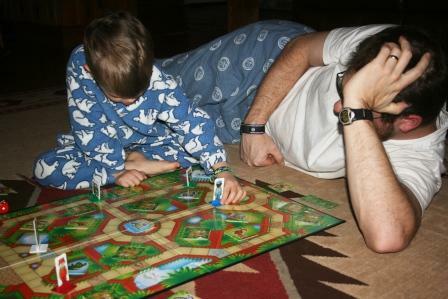 i hope family board games make a serious comeback! I like winning too... maybe I should find an adult game that makes me feel like a winner. I tweeted this if you want to retweet. My 6 and 5 year old boys have been into games lately. But there is always some tears at the end because someone has to lose. This might be one of those games that makes everyone happy. I think my comment missed. Here it is again, thanks for the game review. My boys aged 6 and 5 are getting into games, however there are tears at the end because someone has to lose. 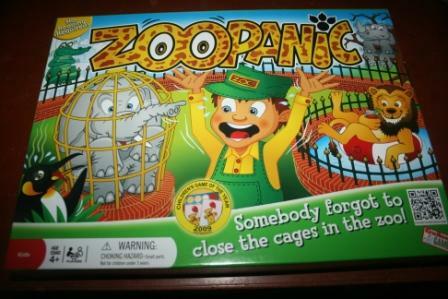 Zoopanic might be an answer!!! Great idea for Friday Night Fun! Sounds like fun. The kids love games! That sounds as an absolutely fun game! Great for during the cold days too! With maybe in the bacground some music by Lindsy Morton! Playing games together with your family is a bonding moment, and help us to make our family get really close to one another,. I love this! Thanks for sharing! :) Have fun! We're always looking for new games! Even better if they can feel like winners when they lose! This game looks like it is a lot of fun! I remember playing games with my family long ago when I was a kid- and I remember how fun it was! My girls are BIG into games lately too. Thier favorites at this moment are Hi Ho Cherry-o & Feed the Kitty. LOL. I love Pierce's ideas about winning! Amy used to get upset when she would win-she felt sorry for everyone else:) She would have loved this game! That looks fun! I like winning too. :) And we could use some new games. Most of our old ones are missing numerous pieces. THis looks like a great game. Hayley would love this. We are into the phase with new board games so I am sure she will love this! Thanks! I am so looking forward to the day we can begin game night. Deaglan is kind of into games but his attention span is still very short. This looks like a good one!